BS in Special Education from Troy University. Highly Qualified in Special Education K-12 and Regular Education K-6. Currently teaching at Goshen Elementary as a collaborative special education teacher. 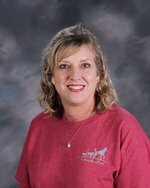 Mrs. Pam Gardner teaches special education at Goshen Elementary School. She is originally from Troy. She attended Charles Henderson High School and Troy University. She is married to Randy Gardner. They have one daughter, Ashlynn, who attends Goshen High School. They also have four grown children and three grandchildren.